I need to think about replacing my insert woodburner in the near future as the grate has burned through and now the glass has cracked. It's probably been there since the house was built in the 1960s so it has served it's time. Also I don't know who made it so I can't get spares so it's time for it to go. My query is that my burner glass door opens from left to right whereas all the ones I've seen on dealer's websites and also on sites such as Leboncoin show the doors opening from right to left. This would not be suitable for me due to the position of the fire and refuelling would be difficult. My existing insert has hinges either side so changing the way the door opens is easy, but all the pictures I've seen don't show hinges on the right hand side, so the question is: if you have an insert logburner installed, can your door be hung the other way round? and if so what make is it please? If there were any showrooms around I could go and have a look but I don't know of any in the area. Brunet Prudhomme in Bonnat has a small showroom with several burners and a bunch of catalogues. he and his wife are very helpful and I recommend them. There are also a few stoves on display in most large DIY stores (Mr. Bricolage and Brico Marche for example). The insert is the French answer to the question: what shall we do with a traditional open fire place. My question: is there any compelling reason to continue this solution? Or is it a constructional design from the sixties, prohibiting a solution like this one? RobertArthur makes a good point. When we bought our house there was an insert fitted & although it heated up the stonework around it , it never seemed to project much heat into the room. After several years putting up with it I plucked up the courage to rip it out, open the fireplace up & replaced with a free standing fire. The difference was incredible in as much as the benefits of the heat production & the efficiency of the fire meaning we also used less wood. Certainly worth a serious thought. Brico marche in La Chatre also have a good selection of fires & inserts. Trying to get more comfort and heat elsewhere in the house there are inserts with built-in ventilation systems. Also available as retrofit units. From what I've seen I consider these add-ons as workarounds, not able to do the same as modern high-efficiency wood stoves. 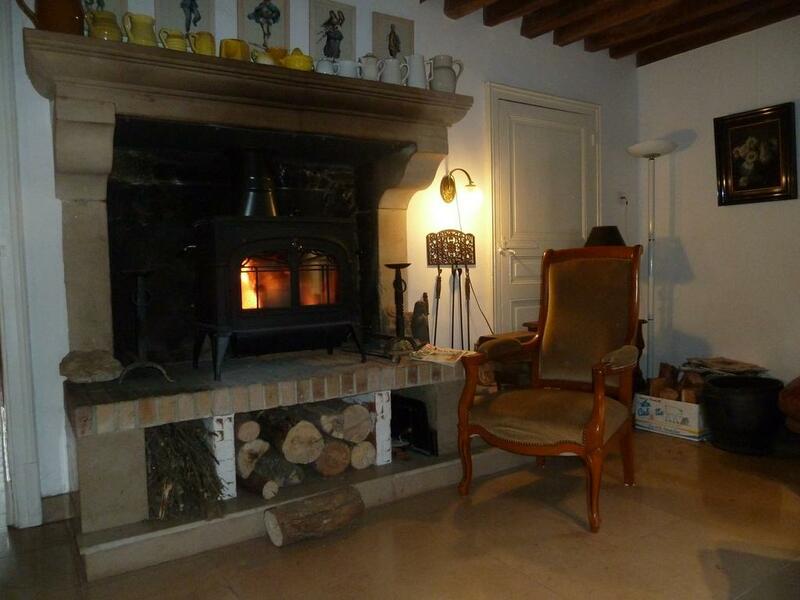 In case of a black-out - not uncommon in la France profonde - I do prefer the autonomy of a wood burning stove. My apologies for not replying sooner but, as there were no initial responses, I neglected to check back later. In my case the fireplace was built round the insert when the house was built and was quite efficient in heating as it had two twin speed fans built in which blew the hot air into the living room. I also have oil fired central heating but tend not to use it too often as the access for delivering oil is not the best. I have since got a Deville turbo insert which has twin glass doors for refuelling so that will solve the problem of the door hinging the wrong way. It also has the twin booster fans as on the original fire. Thanks for your replies and suggestions. Now waiting for the good weather so I can arrange to have it installed.